ETA: I don’t like how this reporter was, but I thought I needed to post it cause Cambio is tomorrow and it talks about “Cambio Cares” which Demi Lovato first is on it starting tomorrow. AOL’s been having a tough half-decade or so, but are looking to turn things around with a new content partnership with none other than the tween obsession of the moment, the Jonas brothers. Cambio, a partnership between AOL and the Jonas Group (that is the actual name of the company; it’s run by the father of the Jonas Brothers and also represents other tween idols like Demi Lovato and Jordin Sparks), is a new video project that will be launching this Tuesday. The closest analogy I can come up with is a more heavily branded Funny Or Die. You can watch a video teaser for the series on Facebook. The Jonas Group will be providing several different web shows, including an entertainment talk show, a late-night talk show, a “docudrama” starring one of the several dozen Jonas brothers (just an estimate), and other webisode series. To give an idea, the first series is called “Nick in London”, a miniseries about Nick Jonas gearing up to perform in a London production of Les Miserables. There will also be copious ads– both sponsored videos and traditional banner ads. 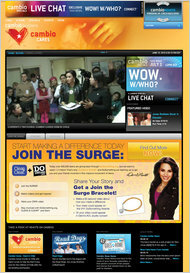 One example is “Cambio Cares”, a Bayer-sponsored series. This new site isn’t likely to turn all of AOL around, but as far as this kind of commercial tie-in goes, they could do a lot worse than the Jonas crew. The Jonas Group has proven adept at marketing their product (also known as young singers/dancers/actors/whatever) to their screaming tween demographic in all sorts of ways, and the rabid fans will probably tune in to Cambio as well. What they’ll do in a year when the Jonas brothers aren’t cute anymore, well, that’s a thought for another time.